More homeowners nowadays employ a person or a service to clean their living spaces. As a home services company, we at The Grout Medic have the utmost respect for the men and women in our homes cleaning backsplashes, scrubbing shower tiles and mopping floors. However, while those professionals have their specialties, so do the technicians who provide grout cleaning services with The Grout Medic. If you want to maintain the integrity of your grout, only trust the specialists at The Grout Medic. While cleaning services work hard, they lack the knowledge, training and equipment we use to properly clean grout. Here are three reasons you shouldn’t trust a cleaning company to care for your grout and why you should, instead, request grout cleaning services from The Grout Medic. Cleaning services tend to be fairly old-fashioned in their approach to their work. They come in with a bucket and a hard-bristled brush, squirt some chemicals into the mix and get to work scrubbing surfaces. The problem is that, in many ways, less is more when cleaning grout. While “elbow grease” is a worthy tool in some other projects, a lot of harsh scrubbing will cause damage to grout, breaking it down and making it crumble over time. This could lead to another call — this time to a grout repair service. At The Grout Medic, we use vapor technology in our grout cleaning services, using measured pressure and hot steam to force dirt, dust, mold and mildew out of the grout. 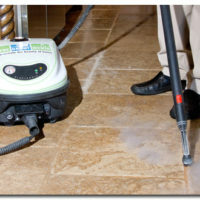 This process sanitizes the grout on your floors, kitchen backsplash or shower walls, and also restores their appearance. Just as rough scrubbing damages grout, cleaning agents can also harm the sand-based porous material. Chemicals inevitably left within the grout’s pores after cleaning break it down over time. And this goes for natural cleaning agents — vinegar, lemon juice or bottled “natural” products — as much as it does traditional cleaners. Also, using dirty or discolored water on grout will only make the porous substance pick up more gross and gray material. If your cleaning person isn’t dumping and refilling their bucket with clean water frequently, all that dirt is simply being reapplied to the grout in different places. The Grout Medic’s vapor-based grout cleaning tools produce a consistent stream of clean, clear water to ensure a great result, every time. Home cleaners don’t focus on just one thing. The Grout Medic focuses solely on grout cleaning services, grout sealing and grout repair, tile replacement services, water damage repair, making us the ideal choice for all your grout needs. We have the training and experience to spot problems or early signs of cracking and crumbling among your grout lines. If we identify an issue, we can offer you a reasonable estimate for grout repair services to resolve the problem. Once your grout is in good shape, The Grout Medic technician can complete grout sealing services, which will help your grout look great for years to come! To keep the grout between tiles on your floor, backsplash or shower wall looking great and lasting a long time, only trust grout cleaning services from The Grout Medic.